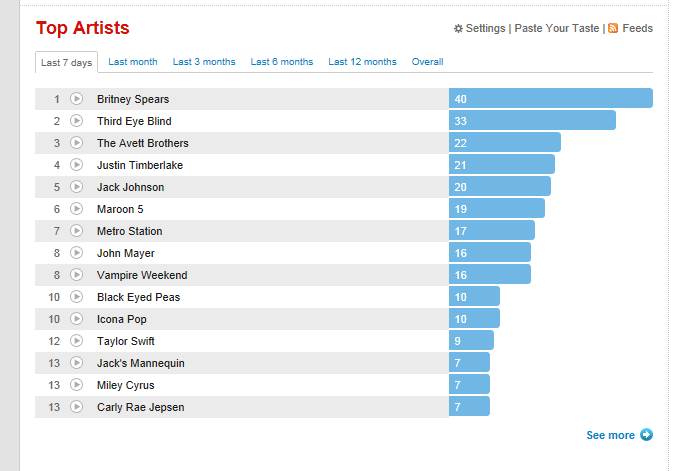 It was yet another February and Valentine's Day where I was #foreveralone and because of that Britney Spears was rulng my most listened to tracks for the week that ended on the 16th. She is seriously my go-to for upbeat, fun and poppy music and anytime I get depressed I tend to listen to her and her albums heavily. Icona Pop entered my life through their infectous single "I Love It" and Justin Timberlake released the second single/promotional single 'Mirrors' that has totally sold me on this era, which if I'm completely honest with you, I was a little leery @ because of the weak first single 'Suit and Tie'. The single he just released - 'Mirrors' is literally everything and I love, love, love it. PS. I added the lemonhead things to my private entries and now I can't seem to post publicly w/o them? Is there a way to override the mood theme for public postings? Figured it out, nevermind!